Misha Zigelbaum, an adjunct professor of mathematics whose love of teaching math spanned two continents and four boroughs, died suddenly after heart surgery on Nov. 3. Zigelbaum’s humor and warmth belied a difficult past, said family and colleagues. “He didn’t pay much attention to the dark side of life, there was always a fun story to be told instead,” said Mila Martynovsky, an adjunct professor who shared an office with Zigelbaum for several years. “I will always remember him as a very caring personality,” said Janusz Golec, Ph.D., chair of the Department of Mathematics, who said Zigelbaum had worked at Fordham for 13 years..
Martynovsky said that Zigelbaum always put his “students’ personal situation in the mix” when assessing their abilities, taking extra care if he knew they were going through tough times. It’s something he did with colleagues as well. 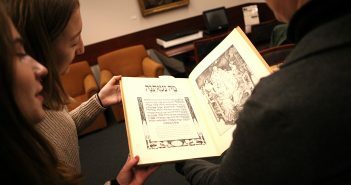 Zigelbaum’s daughter, Elaine Itkin, said that his love of math extended well beyond the gates of the Rose Hill campus. In addition to teaching college students, he also did after-school tutoring of grade school students in New Jersey, the Bronx, Brooklyn, Manhattan, and in Queens. He developed his own teaching techniques that he willingly shared with parents. Itkin said that her father, who was Russian, had started teaching math in his homeland after college in the 1980s. 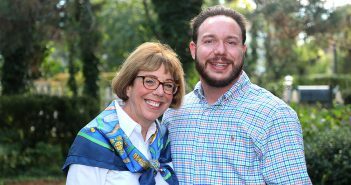 She said he wanted to attend Moscow State University, but was hampered by his Jewish last name. “Back then there was a quota for how many Jews got to attend the university,” she said, and Jews faced discrimination in testing. Even tough her father scored very high—the equivalent of 100—in the mathematics portion of the exam, he was given a low score on an essay section. “They would specifically fail you in the essay to make an excuse why they wouldn’t take you,” she said. When he married, Zigelbaum took his wife’s Ukrainian last name so that the family would not have to face similar bigotries. But when he entered the United States, fleeing religious persecution, “he got his name back,” she said. 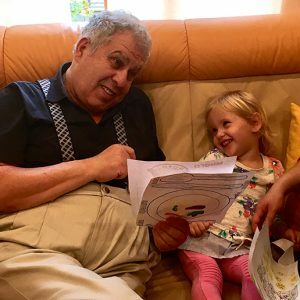 MIsha Zigelbaum tutors his his youngest student, his granddaughter Sophia. Though he held a master’s in mathematics from another Russian university, in the United States he earned a second master’s in education. With the two degrees, he devoted the rest of his life to teaching math. Itkin said that in October her father began to tutor his youngest student in math ever: his two-year-old granddaughter, Sophia. The two counted birds, compared big numbers to small numbers, and before leaving he gave her homework.